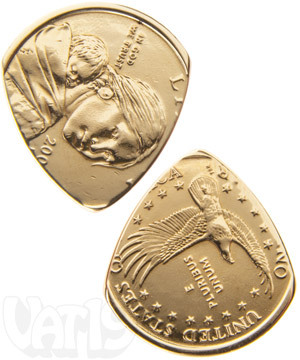 Golden Dollar Coin Guitar Pick: Made from a Sacagawea dollar coin. The Golden Dollar Guitar Pick is made from actual US currency. 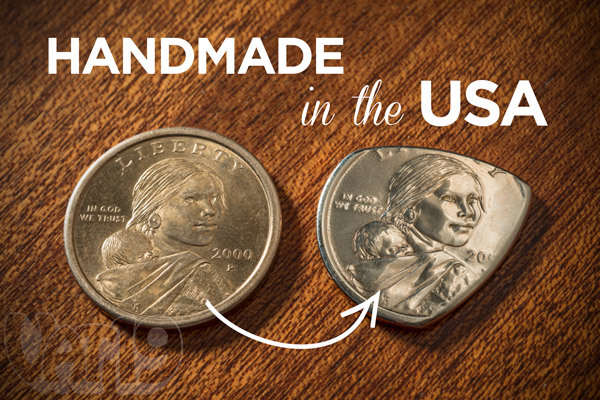 Artisans carefully cut a Sacagawea (aka "golden dollar") $1 coin into the classic teardrop shape and then hand polish the edges into a smooth and beveled finish. Distinctive due to its golden hue, the Golden Dollar Guitar Pick provides a bright sound without wearing out your strings prematurely. A portrait of Sacagawea is engraved on one side of the 2mm-thick coin while the reverse features an eagle. 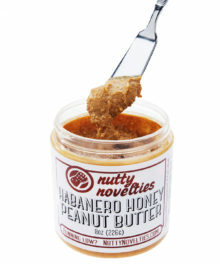 Made by hand in the USA. Thankfully, these unique guitar picks are far cooler than our punning skills. (Yes, punning is a verb). Each of these gold-colored guitar picks is handmade from US currency. 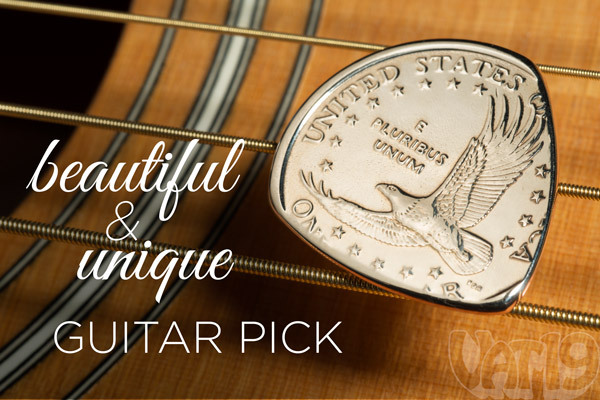 A one-dollar coin is cut and polished into the traditional teardrop shape of a guitar pick. All musicians will appreciate the uniqueness of the Gold Dollar Coin Guitar Pick. The "golden dollar" is way more popular as a guitar pick! The one dollar Sacagawea coin (aka the "golden dollar") was first introduced into circulation in the year 2000. Unfortunately, it has been exceedingly unpopular with both the general public and businesses (oops, U.S. Mint). While the $1 coin has not been successful as a currency, it has found new life as a guitar pick! It's smooth, yet features enough design elements for ample grip, and the manganese brass finish provides a distinctive golden sheen. Very cool. Each Golden Dollar Coin Guitar Pick is made by hand in the USA. The obverse of the golden dollar features an engraving of Sacagawea. The reverse depicts a majestic bald eagle. The artisans painstakingly cut the coin so that both the portrait and the eagle are preserved in their entirety. After being cut, the coin is hand-polished to create a smooth and beveled edge that prevents string wear. 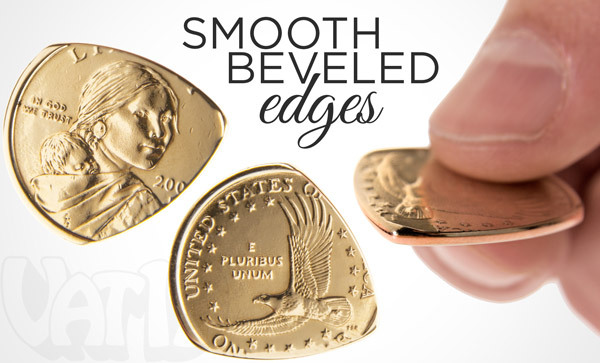 The smooth, hand-polished edges of the Dollar Coin Guitar Pick help prevent weathering of your strings. Question: Isn't it illegal to alter US currency? Answer: Yes, but only if done fraudulently. 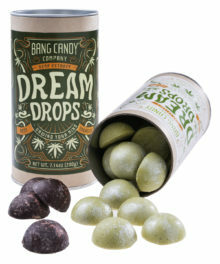 I think we've all seen those vending machines where a penny is flattened and a new design is imprinted on to it. Because there is no fraudulent intent, the activity is OK. In the case of these picks, there is no fraudulent intent. It's clearly a guitar pick and therefore perfectly legal. An example of fraudulent intent would be someone trying to alter a nickel in order to pass it off as a dime. Question: Is it made out of gold? Answer: No, it simply has a golden luster due to its manganese brass finish. The core is made from copper. Question: Is it slippery? Will it fall out of your hands while playing? 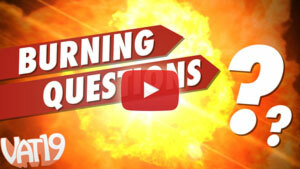 Answer: No and no! The engravings provide ample grip on the face of the pick. Only the edges are buttery smooth. 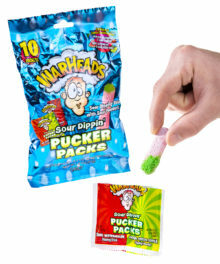 Question: How does the sound it produces differ from a traditional pick? 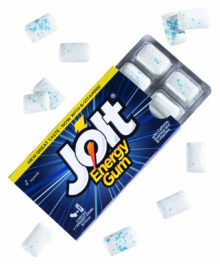 Answer: Our resident guitarist took these suckers out for a test drive and provided the following: "It's definitely a bright sound. There is sharp attack to the strum. You will hear a bit more of a metallic sound than a traditional pick. I didn't have any problem holding on and since I used to play with extra heavy picks, I liked it." Question: What about the thickness? What's the gauge? Answer: The pick is 2mm thick. That definitely puts it in the heavy to extra heavy category.